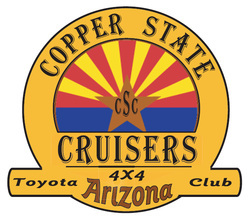 The largest and most active Toyota 4x4 club in Arizona. Check back here often or o﻿n IH8MUD for up to date info of the next Cruiser meet, or simply to read what happened at the last one. We have monthly meetings in both the Phoenix and Tucson Greater areas. If you are looking to become a member go to our online application section under the membership heading. Click the links below for a map of the meeting location in your area.